You are here: Home / Produce Reality TV Shows / 100 Tips. 1 Million Thanks. 100 Tips. 1 Million Thanks. Episode 100! Thanks for supporting us over nearly five years. To celebrate, we made you a “thank you” gift. It’s a brand new resource we wish we had when we started in this business. It’s completely free, and it will save you hours of time. Plus, a very special tip from Joke. And of course, a tiny bit of nostalgia from the early days of the podcast. When we started this podcast, it was for a lot of reasons. We wanted people to know what it was really like to work in unscripted television, documentary series, and reality TV. We also hoped we’d meet other filmmakers who might want to team up with us. Look, making TV is awesome, but it can also be stressful. We love what we do, but everyone needs to do something that feels like a break from work. Starting this podcast seemed like a fun hobby that might be useful to a few people. As long as it stayed fun, we’d keep it going. You’ve all made it a blast, and we’re going to continue. 100 Tips. 1 Million Thanks. Producing Unscripted Celebrates 100 Episodes With a Free Gift For You. If you’ve been listening to the podcast for awhile, you know we wanted to do something special for episode 100. More importantly, we wanted to do something for all of you. Unscripted Television: 100 Tips for Breaking In and Career Success. Want the free PDF? Head over and share for free download. Much more than just a list of podcast episodes, this is a nine chapter book organized by topic. It’s your “at a glance” guide to understanding the unscripted television business. And…Biagio’s NBA dreams gone wrong! Press that giant PLAY button up top for a gleeful episode with a few surprises, and a lot of “thanks” to all of you. 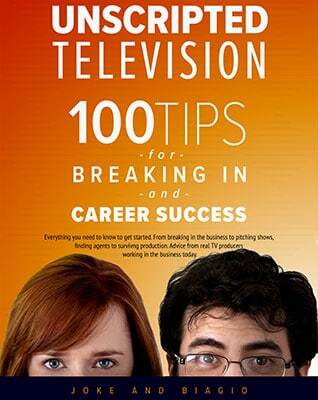 Unscripted Television: 100 Tips for Breaking In and Career Success. – the new ebook we made for you. Thanks for sticking with us all these years! 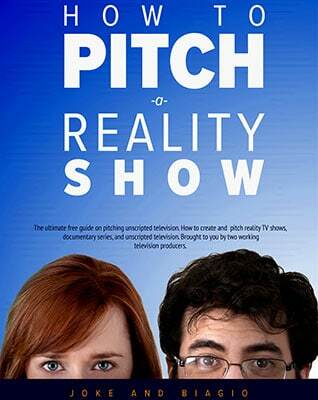 Our first free ebook, How to Pitch a Reality Show – if you read our new “100 Tips” and this one, you’ll be miles ahead of the competition. Follow us on Twitter: @JokeAndBiagio – we’re around often and try to respond to most tweets. And we’d like to hear from you! Unmasking a Killer is the new CNN/HLN series we have with producer Todd Lindsay. Stay tuned for a podcast ep with him next year.